A lot of students I talk to have questions about solvents, so I’ve decided to put together a reference post on them. Solvents can cause considerable confusion in reactions, because they’re listed along with the reagents of a reaction but often don’t actually participate in the reaction itself. And to be honest, a lot of instructors (myself included) are less than consistent about when to include solvents and when not to. So the whole exercise can come across as somewhat arbitrary: when do you know when to include the solvent? Let’s back up. What’s a solvent, anyway? (Non-participatory) to dissolve the reactants. Remember “like dissolves like” ? Polar solvents are best for dissolving polar reactants (such as ions); nonpolar solvents are best for dissolving nonpolar reactants (such as hydrocarbons). Participatory: as a source of acid (proton), base (removing protons), or as a nucleophile (donating a lone pair of electrons). The only class of solvents for which this is something you generally need to worry about are polar protic solvents (see below). OK. So what does “polar” and “non-polar” mean? Polar solvents have large dipole moments (aka “partial charges”); they contain bonds between atoms with very different electronegativities, such as oxygen and hydrogen. Non polar solvents contain bonds between atoms with similar electronegativities, such as carbon and hydrogen (think hydrocarbons, such as gasoline). Bonds between atoms with similar electronegativities will lack partial charges; it’s this absence of charge which makes these molecules “non-polar”. There are two common ways of measuring this polarity. One is through measuring a constant called “dielectric constant” or permitivity. The greater the dielectric constant, the greater the polarity (water = high, gasoline = low). A second comes from directly measuring the dipole moment. There’s a final distinction to be made and this causes confusion. Some solvents are called “protic” and some are called “aprotic”. What makes a solvent a “protic” solvent, anyway? Protic solvents have O-H or N-H bonds. Why is this important? Because protic solvents can participate in hydrogen bonding, which is a powerful intermolecular force. Additionally, these O-H or N-H bonds can serve as a source of protons (H+). Aprotic solvents may have hydrogens on them somewhere, but they lack O-H or N-H bonds, and therefore cannot hydrogen bond with themselves. For the average first semester student, these distinctions come up the most in substitution reactions, where hydrogen bonding solvents tend to decrease the reactivity of nucleophiles; polar aprotic solvents, on the other hand, do not. There are 3 types of solvents commonly encountered: nonpolar, polar aprotic, and polar protic. (There ain’t such a thing as a non-polar protic solvent). OK, enough yammering. Here are some (hopefully useful) tables. 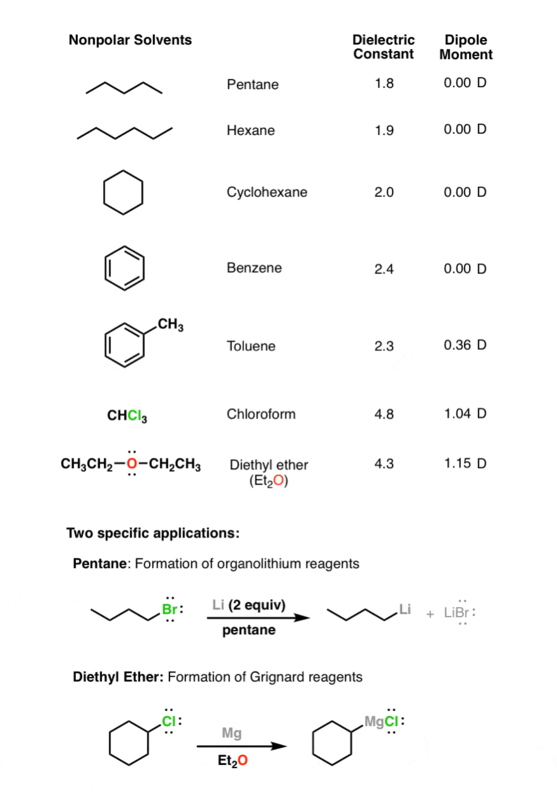 These solvents have low dielectric constants (<5) and are not good solvents for charged species such as anions. However diethyl ether (Et2O) is a common solvent for Grignard reactions; its lone pairs are Lewis basic and can help to solvate the Mg cation. These solvents have moderately higher dielectric constants than the nonpolar solvents (between 5 and 20). Since they have intermediate polarity they are good “general purpose” solvents for a wide range of reactions. They are “aprotic” because they lack O-H or N-H bonds. For our purposes they don’t participate in reactions: they serve only as the medium. These solvents all have large dielectric constants (>20) and large dipole moments, but they do not participate in hydrogen bonding (no O-H or N-H bonds). Their high polarity allows them to dissolve charged species such as various anions used as nucleophiles (e.g. CN(-), HO(-), etc.). The lack of hydrogen bonding in the solvent means that these nucleophiles are relatively “free” in solution, making them more reactive. For our purposes these solvents do not participate in the reaction. Polar protic solvents tend to have high dielectric constants and high dipole moments. Furthermore, since they possess O-H or N-H bonds, they can also participate in hydrogen bonding. These solvents can also serve as acids (sources of protons) and weak nucleophiles (forming bonds with strong electrophiles). These types of solvents are by far the most likely to participate in reactions. 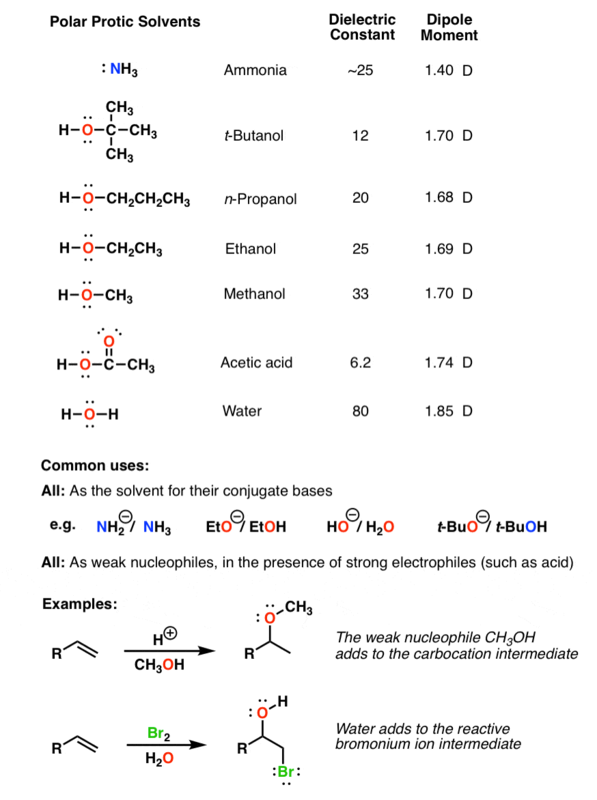 There are many examples (too many to list) where a polar protic solvent such as water, methanol, or ethanol can serve as the nucleophile in a reaction, often when a strong electrophile (such as an acid) is present. So if you see this type of solvent, be on the lookout. I’m sure I missed something or something wasn’t clear. If you’d like something expanded on, please leave a comment! Since dipole moment is based on magnitude and separation of charges, I imagine the reason is that the 3 C-Cl bonds cancel each other out more than the 2 C-Cl bonds. If I’m not mistaken, I think chloromethane (CH3Cl) has a even higher dipole moment than either DCM or chloroform. I’m not the world’s best at algebra but I would have thought that the vector sum of the three C-Cl dipoles would lead to a greater overall dipole than just a single C-Cl bond. Perhaps the C-H bonds provide additional electron density that allows for greater overall polarization of the molecule. I would have thought that it is because Carbons 2p2 electrons are being shared between more Chlorines in the Chloroform you have a weaker dipole moment between each of the C-Cl bonds than in DCM. So you have a greater dipole moment in DCM. Dipole moment of chloromethane is 1.09, DCM is 1.60 and Chloroform 1.04. With chloromethane I imagine that one Chlorine is not sufficiently strong enough on it’s own to form a large dipole moment. Further Chem: Drawing out the molecular orbital diagrams may help as it would show which electrons enter which sub shell and that would show you if it is entering a higher or lower energy level. If you make respective carbocations of these three species by removing 1 chlorine atom and compare their stability, clearly ch3+ is most stable, that means chloromethane would most likely to be polarised. Actually, CH3+ would be least stable. Don’t forget that Cl can donate a pair of electrons to form a pi bond. @James, But as Cl is 3rd periodic element where C is 2nd periodic, I don’t think their p-orbital will overlap very well due to size difference, in that case we have to prefer inductive effect over resonance. For F though your point may be valid, it can be verified if the order of polarity of Fluoro-methanes are reverse of Cl substituted methanes. You’re also missing the fact that there is an additional Hydrogen atom in DCM vs chloroform. Because Hydrogen is more electropositive than Carbon the dipole moment is lower. For example, compare the electronegativity between HCl and CCl bonds. Although this difference is small it’s effect on the dipole moment is apparent. I think it is because the inductive effect of the three Chlorines on chloroform cancel out much of the outward negative dipole while with DCM, there are only two chlorines to withdraw electrons, thus less cancelation of the inductive effect. Back to vector sums, folks. If you place CH2Cl2 and CHCl3 on a cartesian diagram so that the overall dipole would point to a value of -Y (straight down, traditionally), then the C-Cl bonds have larger -Y values for CH2Cl2 than for CHCl3. Simple geometry puts the angles from the x-axis as 35º below X for CH2Cl2 and only 15º below the X-axis for CHCl3. Hard to describe, but if you build a molecule and imagine it on a cartesian coordinate system, you’ll be fine. Its doesnt matter 3 Cl- are withdrawing electron density….but they are pulling it in different directions……dipolemoment is a vector quantity and should be subjcted to vector additions as u know in ccl4 DP=0…there are 4 cl- ions yet it is 0….coz they are in different directions….the 3 cl- ions will be as far as possible due to steric repulsions..so they pull in differrnet direction….like a big box of chocolate is pulled by kids in all direction. – paragraph 5: “Use a polar solvent to dissolve a charged species (such as, say NaOH), but don’t use it to dissolve” (the sentence ends here) – dissolve what? – the reaction above Polar protic solvents – shouldn’t the stereochemistry of the C atom in the product be reversed? Otherwise, great work as usual. Thanks, I’m happy that you spotted the stereochemistry example. Important to make sure inversion is there! if you understand why HI is more acidic than HF despite the strong electronegativity of flourine then you will not have issue with dichloromethane, being more polar than chloroform, despite the higher number of the electron withdrawing group attached to the carbon, the bond- strenght is a key, and the faster the bondbreaking the beter the polarity of the solvent to pertake in reaction. note this is limited to polarity. Exactly, never thought to compare acid strength to polarity of solvents. Acid/base strength is more useful in comparison to nucleophilicity trends. James, your work on this topic(solvents) very amazing. Many student confused about which solvent protic/aprotic as well as polar/non-polar. awesome work. thank you. Hats of you. what happens when bromine is added to chloroform and also bromine added to dichloromethane ? I believe what your referencing is a “bromine test” for allegedly saturated hydrocarbons. If bromine is added to chloroform, I believe the bromine should stay the diatomic elemental color because chloroform is saturated and therefore will not react, it should react the same with DCM. The examples for the uses of each of the solvents were exactly what I needed help with and were indeed quite helpful. Those would be areas on interest to expand on. Thank you! which is the most efficient running solvent between polar and non polar solvent and why? that’s a hard question to answer without being more specific. all I know is that it all depends on the polarity of the content you want with the solvent. If you want to run a polar content, run it with a polar solvent as the polarities are the ones that determine the interactions.. so polar to polar and non-polar to non-polar. I have a question about Acetic Acid’s low Dielectric Constant. 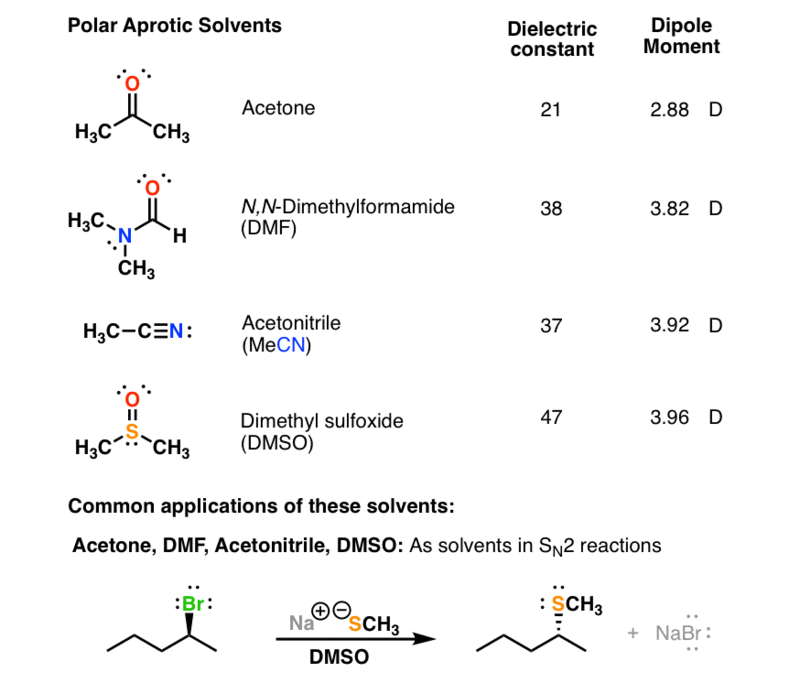 Compared to all the other Polar protic solvents it’s dielectric charge is very low yet when doing the same comparison its dipole moment is exceedingly high. Why is this? Great question Elon. If you look at the trend in the table above notice that there are two O’s in acetic acid and the rest have just one or a single N atom. The dipole moment is low because the displaced charges between the HO and CO bond in acetic acid can dampen or stabilize the partial charge generated. A dipole vector points away from H and toward O while another points away from C and toward O. The negative end of the HO vector is closest to the positive end of the CO vector hence the dampening of the induced charge. This would lead to the conclusion that the sum of the charges, q in acetic acid containing two highly electronegative atoms is smaller than q in the alcohols containing only one highly electroneative atom. Hence, the larger dipole moment in acetic acid but smaller in H2O which is where the dipole vectors are aligned in a way that adds the magnitude of the vectors and results in the higher 1.80D. How is the electrical conductivity change with polarity? If the voltage is high, can polar aprotic solvent also electrolysis? please tell me why did wrote methyl shift bt not methanide. however CH3 is bearing a negative charg some others examples like phenyl . As far as I know, Hexafluoroisopropanol (HFIP) is a good solvent for polymers, even though it is a polar protic solvent. But intuitively I don’t get how it works. Please explain this for me. Thank you. The best property of HFIP as I know is it can dissolve either polar in non-polar molecule or non-polar in polar molecule. I used it for making the polymer blending between polyester and protein. But I don’t know how it works since I am a biologist, not chemist. If someone know about that, please give me some explanations. Chloroform is not a nonpolar solvent. It is polar. Remember that polar/nonpolar is a continuum. Using a polar protic solvent increases the rate of the reaction right? Well, how am I suppose to know whether to use a type 1 or type 2? Could anyone suggest materials in wich are resistance to wax (hydrocarbon)?? this is so much better then my super dense vollhardt text book >.< thanks so much! Diethyl ether is polar ! ! ! It is more polar than hydrocarbons, but is still not miscible at all with water. Therefore I’d classify it as a non-polar solvent. Thank you sooooo much!! You rock :). James, can you explain why the addition of HBr to alkenes WITHOUT the use of alkenes is favored by polar, protic solvents? Why protic? Sorry, “WITHOUT THE USE OF PEROXIDES”. Hi Roger – the rate limiting step will be formation of the free carbocation. The rate will be increased if we use a solvent with a high dielectric constant (i.e. polar). Solvents with high dielectric constants also tend to be polar protic (e.g. methanol). However, polar protic solvents are not a requirement for HBr addition. I would be wary of using a polar protic solvent because it can act as a nucleophile, trapping the carbocation. My version of March’s advanced organic chemistry doesn’t mention typical solvents for HX addition. A refined product was once described to me to be a “solvent-solvent”. Dr. James, could you enlighten me as to what that might mean in terms of its ability to dissolve various types of chemical blockages? 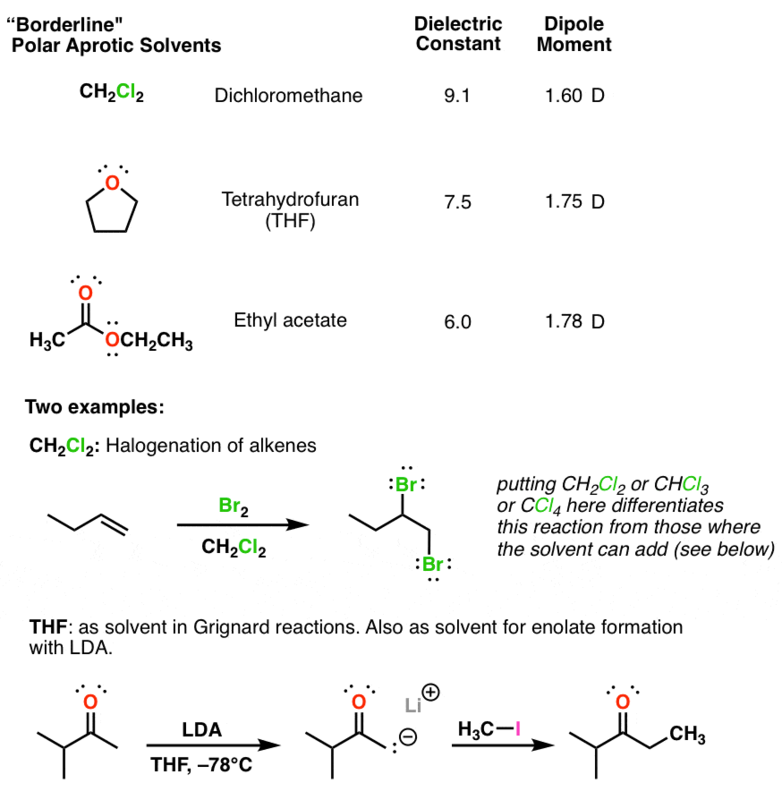 what solvent is best for radical synthesis? Carbon tet is great, if you can find it. Nice high boiling point. when methyl iodide is treated with sodium metal, ethane is formed .The reaction takes place when ether is used as a solvent !!!!!!! why is that so???? Which method use remove moister in dimethayl formamide ? how can you identify polar from nonpolar solvents? Sometimes two phase solvents are being used e.g THF/H2O. Why is this the case? Is Azobisisobutyronitrile highly soluble with dimethylformamide? If you combine these and then add polystyrene, will the compound dissolve into the polystyrene? AIBN is soluble in DMF, yes. It’s a free radical initiator. I think the reaction you’re describing is free radical polymerization of styrene to form polystyrene. Can you explain how cosolvents work ? For eg xylene-methanol or xylene-DMSO in certain ratios ? Do you have any references on how mixed solvents work and how to determine their ratio ? how to easily find out polar protic and polar aprotic? Does it have an OH or NH group anywhere? If so, it’s polar protic. Why chloroform stored in ambered color bottle? Using amber bottles reduces any chance of photochemical degradation, which can happen over time. First of all, congrats on your website! It’s amazing and very helpfull. I need some help with the application of this concept you explained. Iam not a chemist , but I need this knowledge in organic chemistry for liquid chromatography (UFLC-MS/MS) to quanitfy procyanidins (polar compounds) using a C18 silica columm. Older publications mention methanol + acidified whater as a mobile phase and the newest ones use acetonitrile + acidified water. Specialized material suggests a replacement of acetonitrile by methanol due to cost reduction and, in my case, I only had as MS grade the metanol (ACN as HPLC grade). Both are polar but ACN is a polar aprotic and metanol a polar protic. Although their dielectric constant are very similar (maybe that is why some researchers suggest the replacement), should I expect a huge difference in quantification due to the possible bondings using methanol ? I’m currently having a little bit of trouble with a reaction and I was hoping you could help me. Is there any way that an hydrolysis reaction can be performed in a solvent other than a proctic one? I’ve been trying with Propylene Glycol or Glycerol but they don’t seem to work as well as water. Propylene glycol and glycerol are protic. Thank you for making nonpolar solvents a lot more clear. It makes a lot more sense now after looking at all the compounds you listed. So a nonpolar solvent typically does not have any hydrogen bonds? After looking at chloroform, the solvent is nonpolar because the charge must be evenly dispersed among the three chlorines, right? “Polarity” is a bit of a continuum. One way of measuring polarity is through a number referred to as the “dielectric constant”. Water has a very high dielectric constant, whereas a nonpolar solvent like hexanes has a very low dielectric constant. For me, a useful “hard line” for polarity is whether or not the solvent is miscible with water – e.g. methanol, ethanol, DMSO, DMF, THF, are all mixable with water, and are quite “polar” . Solvents like diethyl ether, hexanes, dichloromethane, chloroform, are not water soluble and are generally classified as “non polar”. And yes, you’re correct in stating that non of these solvents have any hydrogen bonds. That’s not to say that there aren’t some polar aspects to some of these solvents – for example chloroform has a dipole moment, as does diethyl ether, so they are more polar than, say, pentane. I have a question. Why is polar protic isopropanol miscible with both cyclohexane and acetonitrile, but cyclohexane and acetonitrile are not miscible? More generally, I understand why “like dissolves like” for the polar protic and polar aprotic interaction, but why is there an interaction between a nonpolar cyclohexane and a polar protic isopropanol, yet no reaction (nonmiscible) between nonpolar cyclohexane and polar aprotic acetonitrile? So, recall acetonitrile has a N atom and so H-N intermolecular interactions are possible and hence so is hydrogen-bonding. Rules are helpful to get through a specific reasoning but they are developed not to explain how something works but rather to simplify how we think about them in problem-solving. The underlying reason why polar aprotic solvents can surround and encapsulate ions in Sn2 reactions is because hydrogen bonds can interact very well with ions in solution. So as long as 1 molecule of HCN can align so that the O atom in isopropanol is near the H atom in HCN and vice-versa between N atom of HCN and H atom of isopropanol then hydrogen bonding is the main driving force in solvation and thus miscibility. So what would propylene glycol be? How about glycerine? Polar protic. Propylene glycol has hydroxyl groups. diphenyl ether is nonpolar? or polar? It’s a solid at room temperature. Not the most practical solvent. How to compare the strength of given 2 polar protic solvents? Dielectric constant is a good guide. Thank you. But how to determine which species will act as neucleophile? Solvent or another neucleophile? If you have an extremely reactive electrophile like a carbocation, and a solvent that can react with carbocations such as water or alcohols, the solvent will be present in vast excess relative to any other nucleophile. So based on concentration alone, one would expect the solvent to react as a nucleophile. Nice discussion. Does Butanol is polar (I mean, does it miscible with water). If you search “water solubility” with all of the solvents you mentioned, you’ll find that butanol is the most soluble in water than all of them. It is by far the most polar. Why butyl cellosolve is miscible with water?? How to decide whether the solvent used in the reaction would be a participatory one or a non-participatory one ?? Most often, a participatory solvent will have an O-H bond which can be deprotonated after acting as a nucleophile. Would DMSO as a polar aprotric solvent still be able to hydrogen exchange? Say I want to measure IR or VCD of glucose in deuterated DMSO, would I be able to do that without having to worry about hydrogen exchange? Otherwise I would have to deuterated all OH bonds form the glucose first. Deuterated DMSO will not exchange out protons on the OH groups of your glucose. The deuteriums are all attached to carbon. I guess you finaly explained to me a trend I was observing without any idea why. I have often encountered cases where people would use an acid-alcohol (such as HCl-EtOH) solution as solvent. then using an acid-alcohol mixture as solvent allows to be in a nucleophile environment to stabilize certain lower valences of the dissolved ions. So that would be the benefit of working in HCl-EtOH instead of HCl ? What often happens is that the acid will protonate an alcohol and convert it into a good leaving group (R-OH2 +). After loss of water the solvent can then serve as the nucleophile. Would you know where to find information on the electrical breakdown voltages of organic polar solvents? This is the only scientific info I have not been able to find in over 50 years of independent study, assuming I knew what I was looking for..
Good question Jim. I don’t have any special insight here. Why can F- hydrogen bond with the polar protic solvent better than I-? Look at how H-F bonds are far stronger (135 kcal/mol) than H-I bonds (70 kcal/mol). Negative charge is much more concentrated on F.
So it is correct to say that polar protic solvents stabilise the carbocation formed in a SN1 reaction and polar aprotic solvents do not solvate the nucleophile in SN2 reactions thereby maintaining its effectiveness? Do polar protic solvents solvate the nucleophile in SN1 and if so, why is this important? Regarding the solvation of ions ; why water dissolves K+ ions for example more than methanol does ? So incredibly helpful. Thank you for taking the time to develop and post this! OK, thank you Isabella. Glad it’s useful. Hi this really helped my science fair project. Thnx! !,?